Do my applicants need to know my rental criteria before applying for my property? How can I send my criteria to my applicants? You have the option to send a copy of your rental criteria settings sheet as an attachment with the application invite email that is sent to your rental applicants. Attaching your criteria to your online invite allows your applicant to see what criteria they must meet in order to qualify for your rental. You can view and manage the default rental criteria settings for all of the property addresses in your account by clicking "Rental Criteria" on the home screen. 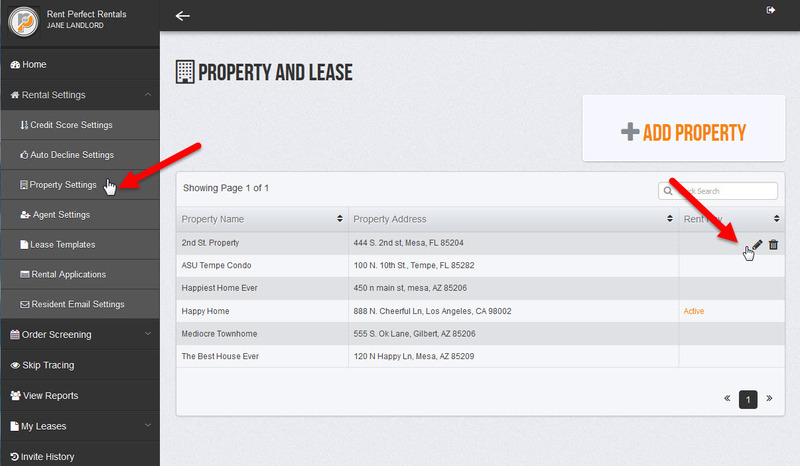 You also have the option to add unique rental criteria for an individual property addresses in the property settings. These instructions will follow the default setting instructions. 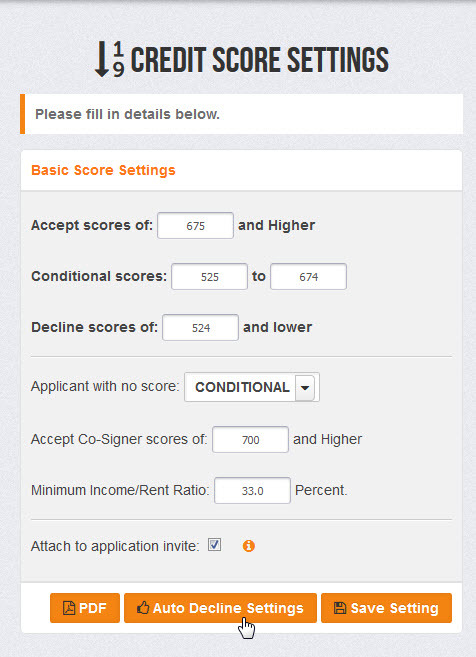 Next, adjust the credit score settings according to your own criteria preferences and click "save settings." If you wish to send a copy of your criteria at the time you send an invite check the box that says, "Attach to application invite." Click the button that says "Auto Decline Settings" to manage additional criteria settings for criminal and eviction record as well. When you are done adjusting your criteria settings click the button that says "PDF" to view a PDF copy of your rental criteria sheet. This is exactly what will be sent to your applicants with the invite email. 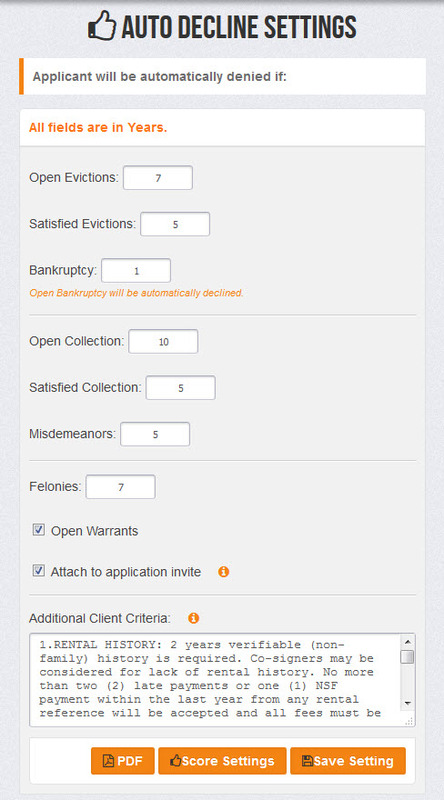 The "Additional Client Criteria" box allows you to add any additional criteria outside of the Rent Perfect background investigation that is important to share with your applicants. Examples of additional criteria for this box would include rental history requirements, employment requirements, pet policies and any other policies for your qualification process. click here for a more detailed article about rental criteria. 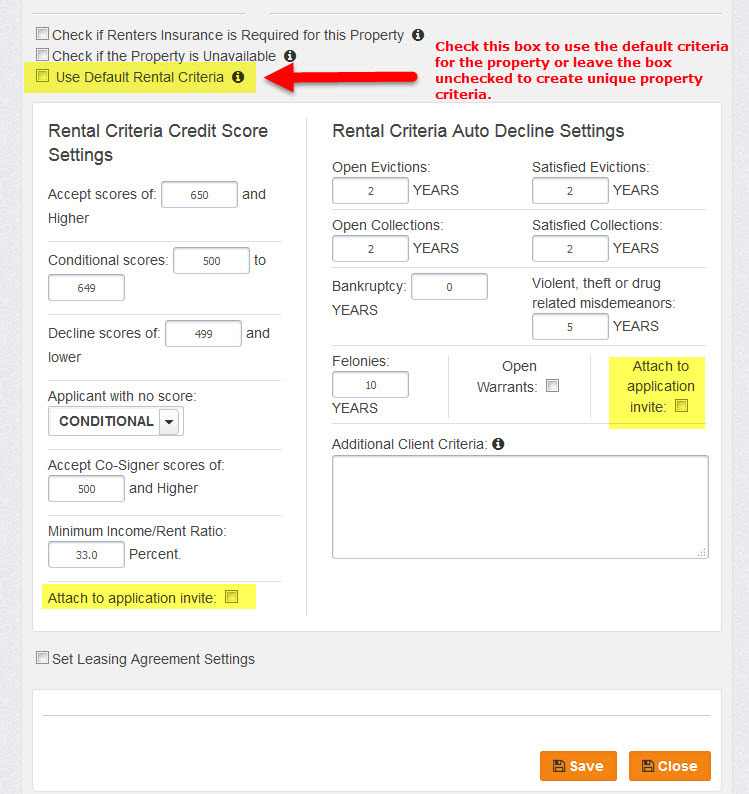 If you would like to create unique rental criteria for a rental property address that is different than the default criteria you can do so in the indivudal property settings. Click "Add property" from the home screen to view a list of your properties, or click "Rental Settings" on the menu on the left side of your account and then click "Property Settings." Click the pencil icon to the right of the property name to make changes or click, "Add Property," to add a new rental property address. Important: In order for a specific property's criteria to be sent in the invite email you must select the property address from the dropdown menu when sending the invite email.